Yes, it was grandiose. Over the top. At the time, Europe was still struggling with the questions and challenges of Brexit, Frexit and Grexit, and the perception of a left-for-dead economy. Since the beginning of the year, the S&P 500 is up 13%. Not bad. But an exchange-traded fund like the Vanguard FTSE Europe ETF (NYSE: VGK) is up more than 21%. And the bank stock I added to the Total Wealth Insider portfolio at the time? That’s the best. It’s outperformed all of those indexes and ETFs by an even wider margin. Suppose you bought none of those things. Did you miss the boat? For one, European bank stocks are still undervalued, whether priced in dollars or euros, compared to their more popular U.S. peers. A basket of EU-headquartered bank stocks like Societe Generale, Commerzbank, BNP Paribas and others has a price-to-earnings (P/E) ratio of 12. A similar basket of U.S. bank stocks, such as Bank of America, Wells Fargo, U.S. Bancorp and the rest carries a P/E ratio of nearly 13. Europe’s banks have another “wind at their back,” finally, in the form of the interest-rate cycle. 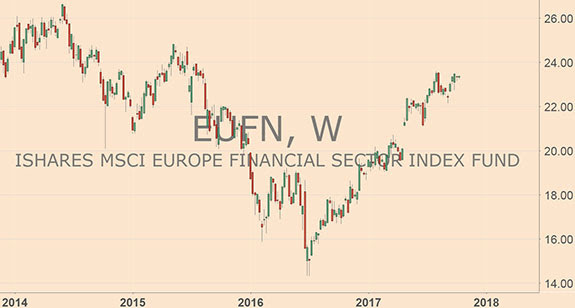 That’s why I believe an ETF like the iShares MSCI Europe Financials ETF (Nasdaq: EUFN) still has a ways to go over the next 12 months and at least another 20% of potential upside gains. So far, the U.S. Federal Reserve has been the only central bank to make a substantial effort at normalizing interest rates at a higher level. But Germany, Europe’s largest economy, recently gave the signal to the European Central Bank (ECB) to switch gears as well. It’s only a matter of time before the ECB takes that advice to heart. Higher interest rates means larger profits for banks in general. And with Europe’s banks having had to contend with actual negative interest rates in some cases (such as in Germany), the change to real rising rates will have a meaningful importance to banks and their profit margins, not to mention higher dividends and stock gains for shareholders.